Did you know there are two art museums right in downtown Tampa that are in walking distance of each other. They are the Florida Museum of Photographic Arts pictured on the left, and the Tampa Museum of Art. Florida Museum of Photographic Arts is a unique building located on 400 N. Ashley Dr., Tampa, FL. It is located right next to the beautiful Curtis Hixon Park, which is located right next to the Glazer Children’s Museum. Florida Museum of Photographic Arts revolves around the arts of life and culture. It is a venue to show history and and current events through beautiful photography. There are collections of well-known photographers. There are currently two exhibitions going on right now. One is showcasing a Cuban Photographer Mario Algaze. The other is a photographer named Platon. If you have a special love for Photography, or would like to learn more about it, definitely check out this Museum. The other art museum in downtown Tampa is the Tampa Museum of Art. This museum is located off of Ashley Dr, Tampa, FL at the following location right next to the Straz Center of Performing Arts. Tampa Museum of Art has a “Vision to create an environment for exploring new ideas and innovative experiences”. They also have a photographic collection as the Florida Museum of Photographic Arts. In addition, they have additional exhibitions for your viewing. There are many opportunities in downtown Tampa to view the arts at these two places along with other art museums in St. Petersburg and Clearwater. Here are two especially convenient ones when you are in downtown Tampa. If you have been to either of these museums, feel free to post pictures of your experiences. The Meadow Pointe neighborhood in Wesley Chapel, FL is a bustling community located north of Tampa, FL in Pasco County. Wesley Chapel is made up of many neighborhoods and conservation areas. There are also a great number of retail shopping areas including Shops at Wiregrass, restaurants, a brand new hospital, and a brand new community college that is currently being built directly in the area. Meadow Pointe within itself is a well developed area with many existing and brand new to be built neighborhoods. They are surrounded by a community club house, several swimming pools, and outdoor activities such as tennis and basketball, and many areas for families to take walks, ride bikes, or just take in all the wonderful surroundings. Windsor in Meadow Pointe is this week’s Featured Neighborhood of the Week. I am happy to bring this area to your attention because it is a brand new development. Windsor in Meadow Pointe is located south of SR 56 and Meadow Pointe Blvd. Standard Pacific Homes is currently working on building their model homes in Windsor. They have been building homes since 1965 and are currently building homes in 8 states. There are a number of homes they are building all over the Tampa Bay area. With that, the Tampa area knows that they are very reputable. It was a very nice surprise to see Windsor as they are in their beginning stages. The best option is to actually visit this community in person, and see it from the very start. As you check out their website here, you will see that it is very apparent how fresh and new this community is. Wouldn’t it be spectacular to say that you were the first family on the block? If you are interested in finding out more about Windsor at Meadow Pointe, let Toni Hedstrom know. She will help you with a personal consultation along with meeting the representatives of this brand new community. Please click here to see my personal pictures from my experience of driving through Windsor. If you would like to check out Windsor at Meadow Pointe Facebook, click here. Click here for more background on Meadow Pointe. Reposted from FloridaRealtors–this is a quick summary of three amendments passed on election day that will benefit Floridians. TALLAHASSEE, Fla. – Nov. 7, 2012 – Florida voters passed three property tax amendments to the state constitution favored by Florida Realtors. In addition, a number of Florida Realtors PAC candidates won their respective districts. However, the state Realtor association also backed another property tax change for the constitution, Amendment 4, that failed to get the 60 percent voter approval rating required under Florida law. • Amendment 2 allows any U.S. veteran “disabled as the result of a combat injury” to receive a property tax break. Currently, only disabled veterans who lived in Florida when the injury occurred can benefit. Effective date: Jan. 1, 2013. • Amendment 9 allows a property tax break exemption to the spouse of military veterans or first responders – law enforcement officers, correctional officers, firefighters, emergency medical technicians or paramedics – killed in active duty. Effective date: Jan. 1, 2013. • Amendment 11 gives local governments the authority to create a new homestead tax exemption for seniors 65 and older, providing they’ve lived in the same home for at least 25 years, the home has a just value less than $250,000, and the homeowner fits a low-income classification. I cannot believe that it is November already. Halloween is behind us, and the holiday season is upon us. What is next besides Thanksgiving and Christmas. After all, Tampa area is endless when it comes to things to do. One thing comes to mind for me since I live in Florida. Well, more than one thing, ideal temperatures, less rain, and Florida manatees. Did you know that November is Manatee Awareness Month? Have you ever seen a manatee? Manatees are the gentle giants of the sea. They have front flippers and a flat tale. Back in history, they were mistaken for mermaids. They love our waters in Tampa Bay and the Gulf of Mexico because of our ideal temperatures. They do not want to freeze to death and are extremely sensitive to cold temperatures. It is my mission to let you know about wonderful places in the Tampa Bay area to view these gentle giants. There are two places in particular that I think about when seeing manatee. One place is called TECO – Tampa Electric – Manatee Viewing Center. The other place that you can view manatee and even swim with them is in an area called Homosassa Springs Wildlife State Park in Homosassa Springs, FL and also in Crystal River, FL. Those two areas are just about an hour north of Tampa, and are towns that are right next to each other. TECO – Tampa Electric – Manatee Viewing Center – When you pass by this place, you will get thrown off. Why? TECO serves as Tampa areas source for electricity in many areas. Manatees flock here because with all of that energy, it creates warmer water temperatures. At this time of the year, and all throughout the winter, and parts of the Spring time, Florida Manatees flock to this area. There are hundreds and hundreds of them that can be seen. The viewing center is extremely educational with many of the presentations that they have, as well as the bridge that leads to the waters of these beautiful sea creatures. You want to know about the best part of the Manatee Viewing Center? It is free! Yes, two of my favorite words are “Fun and Free,” and that is what the TECO – Electric Manatee Viewing Center is like. Check it out! Remember the animals come and go at their free will. If you do not see them one day, that doesn’t mean you will not see a million of them the next day. Homassassa Springs, FL and Crystal River, FL – This area is about an hour north of Tampa, FL, and is surrounded by spring water. Spring water is 72 degrees all year long. You know those days in the summer when the Gulf waters are so extremely hot at 90 degrees? The spring water is still at 72 degrees. For some of you that may be refreshing and for some of you that may be freezing. For the manatee, that is sweet paradise. 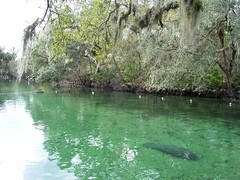 These areas are extremely prominent for manatee swimming/snorkeling tours. If you google Manatee Swimming tours, endless tours will come up. I have had the opportunity of swimming with the manatee. There were about 20 people participating in the tour. We all had wet suits to help us stay a little bit warmer. We also had floating noodles if you wanted to lean on something. This was one of my most favorite tours. I felt that it was an even better experience than swimming with dolphin in the Bahamas. The reason is because the manatees were just free-spirited, and they were just very natural. With swimming with dolphin, they are trained a certain way, and you only have a short time with them. When you are swimming with manatee, they love people, and most likely give you attention by giving you manatee kisses to your goggles. I’ll be posting pictures of my experience swimming with the manatee. You will definitely mind. In summary, keep in mind, seeing manatees in the wild are such a special thing. Tampa area is fortunate to have opportunities for everyone to see these wonderful gentle giants. It is a must do. I hope one day, based on reading this, you will get to have this wonderful, memorable experience.